Have you ever looked at another financial planner’s website, blog or client communication, and thought, “hey, that sounds like mine”. Phrasing, like “peace of mind”, “trusted adviser” and “get your financial house in order”, pop up pretty frequently. And there’s a style that’s professional, yet approachable — a business casual tone — that’s more or less the standard. So adding a bit of personality, can go a long way to helping you stand out from the crowd. Financial planning is about more than just the numbers and analysis and “head” stuff. It’s also about the “heart”. It’s about deep conversations and trusted relationships. It’s not a monotone Bueller-style broadcast about “strategic advice” or “SMSFs” or “wealth management”. It’s a little bit touchy feely. And the personality component, matters. Without it, you just sound like everyone else. So try to loosen up your words a little. Write the way you speak with your clients. If your in-person style is respectful and relaxed, then try writing that way too. Phil Thompson from Thompson Financial Services, produces short weekly videos. In this one, he shares a goofy photo of his dad, and includes some bloopers at the end. It's a serious topic, but it's presented in a very "Phil" way. The Lang Cat are a Scottish marketing and communications consultancy specialising in platforms, pensions and investment companies. A recent job vacancy they advertised tells you a lot about the kind of business they are. You get a pretty good idea of what it might be like to work for them. This role isn’t for someone who needs to work in an institution with the safety net of sixteen layers of management to catch mistakes. You’ll be helping with stuff that reaches senior people around the industry and the press. It’s signed, “lots of love”. The reader gets so much more information, simply through the injection of personality. Applicants know immediately whether it's the kind of business they want to work for, and will help them self-select. Win-win. Now you might not be as bold as The Lang Cat, but can you see how that little bit extra makes a whole lot of difference? If you’ve come from a corporate background, you may have fallen into the “don’t make waves” mindset. Head down. Do your job. Do the job of that one slacker colleague. Get paid. You probably have ideas and opinions, but you don’t share them. You don’t want to rock the boat. But one way to add some personality to your website and blog posts, is to do just that. Some of the independent advisers do this really well. And whether you agree with their views or not, at least they have the guts to not only have an opinion, but share it. Even when it's not popular. Just look at some of the things Scott Pape says. Not only are you extremely clear about where he stands, but it's also not boring. Firstly, a massive dig at the Commonwealth's attempt at being "the ethical bank". He also gives a big middle finger to advisers charging asset-based fees. And Tim Mackay from Quantum Financial, is never short of an opinion or two. He stands out, because he's not afraid to share what he thinks. And he gets positive media attention for his business as a result. Vanilla may be the tastiest flavour of ice cream. It is not the most delicious for communicating. Oh, “I’ll just tell stories…about myself”, you think. “That’ll add a little bit of me”, you think. Banging on about yourself all the time is pretty arrogant. It shows a complete disregard for your audience. Sure, drop in an anecdote to help spice up a blog post. Share a story or talk about an achievement you’re proud of. But if you’re just talking about you and your business, you become like that dreaded dude or dudette at a networking event that won’t shut-up about their semi-prestigious job and fancy car. Ask questions. Be conversational. Be helpful and interested in your readers. Share your experiences. And share what you've learned. You can still write about yourself. Just switch the focus from "you", to using "you" to help your audience. 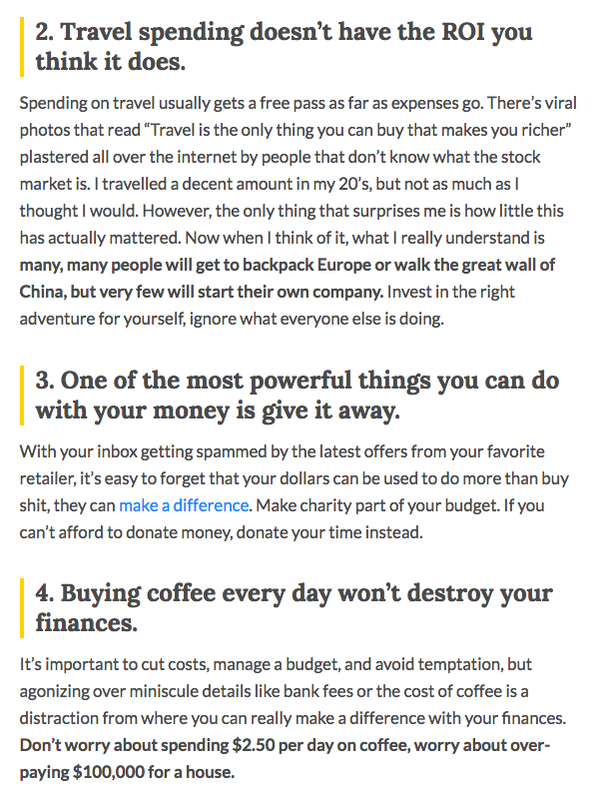 There are a couple of Canadian personal finance bloggers who are excellent at this. In the first example, Desirae from Half-Banked talks through the expenses involved in having a dog (cute pictures included). It's a walk-through of her expectations and the reality of the numbers. If you're thinking about buying a dog, it's super useful stuff. Along a similar "what I've learned" line, Bridget from Money After Graduation, shares what she learned about money in her 20s. Many of the items are counter to what the common viewpoint is, which makes it interesting and thought-provoking. And next time you're introducing new team members to your clients — a style of content that is typically very inward focused — you can have a bit of fun with it, like Verse Wealth did. So next time you're creating content or communicating in a non-face-to-face environment for your financial planning practice, don't forget your personality. Remember, if a robo-adviser has more personality than you, it's time to say "hasta la vista" to boring.